Provides a location for a standard or slim stylus to be easily stored. Installs conveniently with adhesive backing. Minimizes the chance a person will misplace or lose their stylus. Fits alongside, at the top, or in the rear of any smooth surface device. Saves the user money that might otherwise be spent on a new stylus due to misplacement or loss. Electronic tablets, smart phones, and automotive touch screens are easier to use when navigated with a stylus. However, most of these devices do not contain a built in holder that can accommodate a stylus. Because of this, a person can easily misplace or lose their stylus. Stick On Stylus Holder is an adhesively backed holder that allows a stylus to be stored alongside, at the top, or in the rear of any smooth surface devise. These devises can include smart phones, electronic tablets, and automobile touch screens. 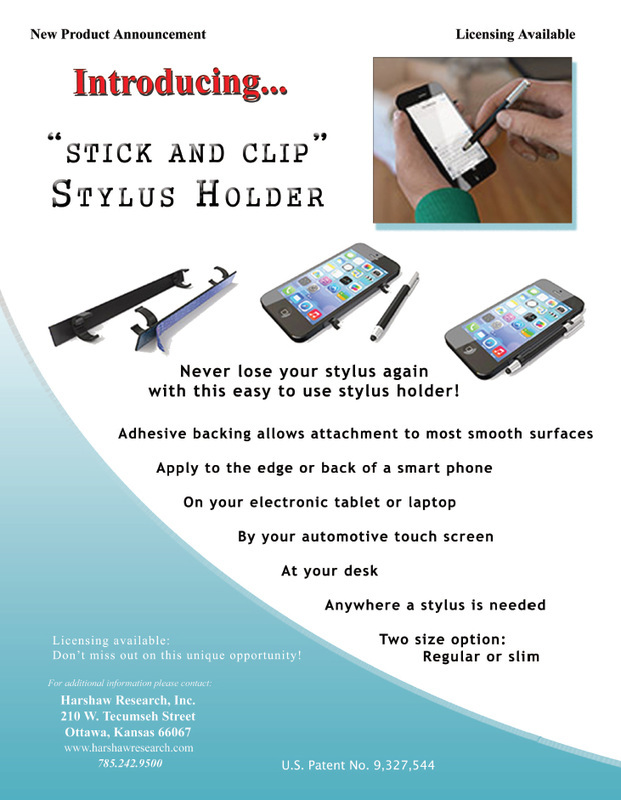 Stick On Stylus Holder is capable of holding either a regular or a slim stylus in the C cups attached to the device. The product may measure approximately 3 inches in height, 3 inches in length, .375 inches in width, and .375 inches in diameter. The exact measurements may vary upon manufacturing. Stick On Stylus Holder can be available as a single unit, as a single unit with a stylus attached, or as a single unit attached to the outer case on an electrical device with or without a stylus included.